The first day of spring in March 20, 2014! Scoop your share of £5,000! Spring has sprung and Houdini’s green fingers are itching to grow a pretty plant. Help it to blossom and you could win a share of the £5,000 up for grabs! Play bingo, go crazy and enjoy the season of winnings at your favorite online bingo site! A session of speed games in just what you need to get in the right mood for winning. Make sure you'll be in the Crazy Room from Friday, March 21st until Wednesday, March 26th, between 2 PM to 4 PM EST because they'll be running a 2 full hours of speed games with prizes between $40 and $80! 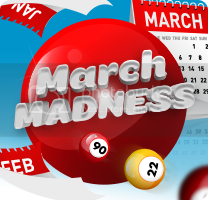 March Madness Spring is just around the corner and they're celebrating with a month of fantastic Bingo offers, including Free Bingo, £100 Guarantees and lots more! This is your lucky month! Feel as fresh as springtime while winning impressive prizes in the bingo promotion! The first signs of Spring are here, so let them fill your week with bingo rewards: fun, money and colors! Starting Sunday, March 23rd and until Wednesday, March 26th from 4 PM to 5 PM EST, in the Desperate Housewives Room we have prepared special dancing games, with prizes ranging between $50 and $100! Spring is here! And to celebrate this blooming marvellous season, they are giving you the chance to bag some terrific bonuses! Deposit £51 - £100 = £20 free bingo bonus. Then on Tuesday 1st April, you will be sent an email with your exclusive bonus code to redeem your reward. If you want a spring in your step, start depositing right now!